For as long as I can remember, I’ve lived my life in anticipation of whatever came next. As a child, that meant looking forward to the following year in school. In high school, I channeled my energies toward preparing for college. Then came a career, marriage, children. . . . Looking back, I can identify the subliminal belief that my “real life” wouldn’t actually start until I’d crossed each of these milestones off my life’s to-do list. I recognize (retrospectively) that by hyperfocusing on the future, I was essentially disqualifying and devaluing the present. In becoming a mom this year, I have officially satisfied my younger self’s (somewhat warped) requirements for moving beyond life’s dress rehearsal and into the actual performance. Words cannot begin to express the gratitude I feel for having entered into this new phase. However, I can’t help but feel wistful about moments and memories that went under-appreciated in the years spent waiting to get here. Now, more than ever, I want to start appreciating life for what it is, rather than what I think it should be. My days as a new mom may not be glamorous, but I’m ready to stop dwelling in thoughts of past and future in order to fully celebrate TODAY. . . regardless of how tedious or monotonous it may seem. It is with this new-found perspective that I entered into reading Emily P. Freeman’s latest book, Simply Tuesday, and her message was exactly what my soul was needing and longing to hear. Emily was a new mom herself when she began the practice of embracing everyday moments—the kind of moments that are found on Tuesday, the most ordinary day of the week. She writes, “I was nostalgic enough to know that one day I would probably miss those days but sleep-deprived enough to not be able to fully appreciate them. 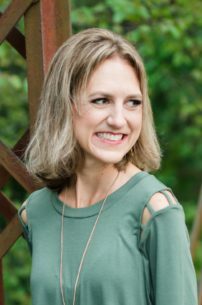 So I decided to mark them, to celebrate on purpose the messy, the lovely, and the unexpected moments of life.” She started a practice called Tuesdays Unwrapped, where she shared these moments on her blog and invited other women to do the same. The habit of celebrating life’s ordinariness continues to be a theme on Emily’s blog, and it is the focus of this book. Simply Tuesday is an invitation to relinquish our idealization of a life that is bigger and better. It offers an encouraging reminder that God’s Kingdom lies in the EVERYday, not just the extraordinary days, and that God is more concerned with drawing us to himself than with calling us to excellence. Emily draws from Scripture as well as her own experiences to illustrate the significance of our smallness, and to highlight the value that is found in embracing small-moment living. 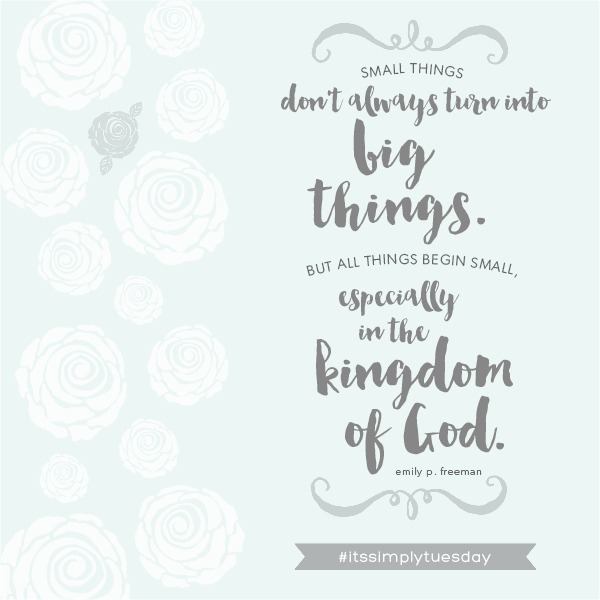 Portions of Simply Tuesday resonated so deeply with me that I felt as though I was rereading passages of my own journal; other lessons from the book were ones that I would not have discerned on my own, and I am grateful for the insights they provided into my personal relationship with God. 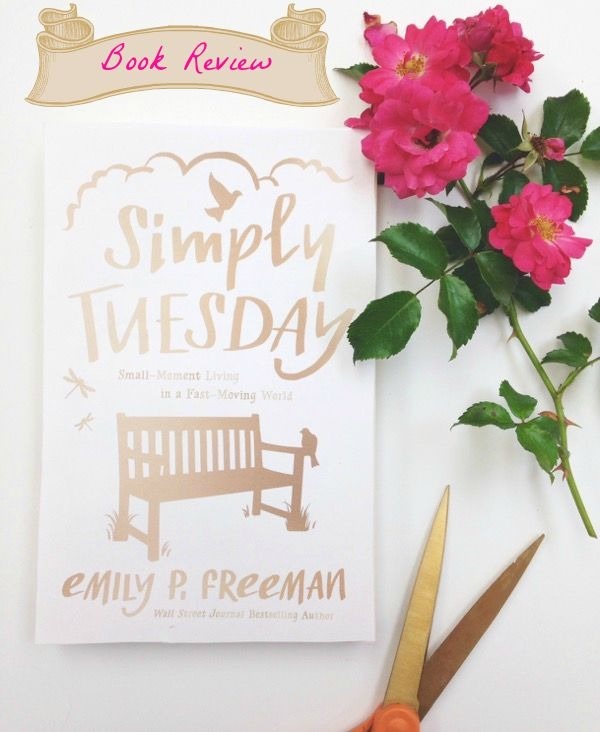 As much as I love the message of Simply Tuesday, the book isn’t without its flaws. The writing meanders at times, with a few chapters that are heavy on Biblical history and light on application. I should also point out that for those who are loyal readers of Chatting at the Sky, a number of passages in the book will be more than a little familiar (quite a few sections are lifted directly from past blog posts). Nevertheless, this artfully written book is a breath of fresh air for a soul that feels squelched by life’s banalities. The message of Simply Tuesday is as powerful as it is simple, and its restful words are ones that our fast-paced generation needs to hear. My Book Rating: 4 out of 5 stars. Simply Tuesday releases today! Head to Amazon to pick up a copy for yourself (and one for a friend—this book will spark some soulful discussion!) You can also go here to listen to Emily read the book’s introduction.